There are so many fun and interesting things that you can do in your yards & gardens now. Below are a few suggestions. Plant bulbs, daffodils are great to plant right now. Don't wait until to late in the season. By then the ground could be frozen and hard, making the chore much more difficult. Cover citrus trees with frost cloth or old sheet when frost is predicted. Care for your holiday poinsettias by removing decorative plastic or foil wrapping. Keep the soil moist by watering. Don't forget your indoor houseplants. They need to be fertilized till the flowering stops. 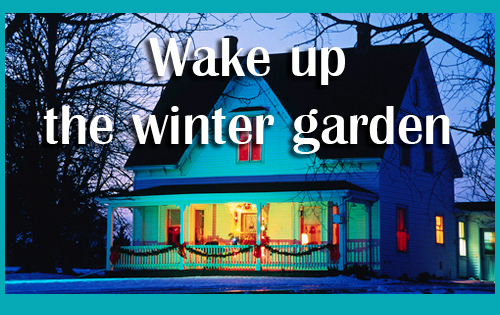 Spread mulch over beds with bulbs, perennials, and shrubs to protect their roots during freeze and thaw cycles. Cut branches for decor. 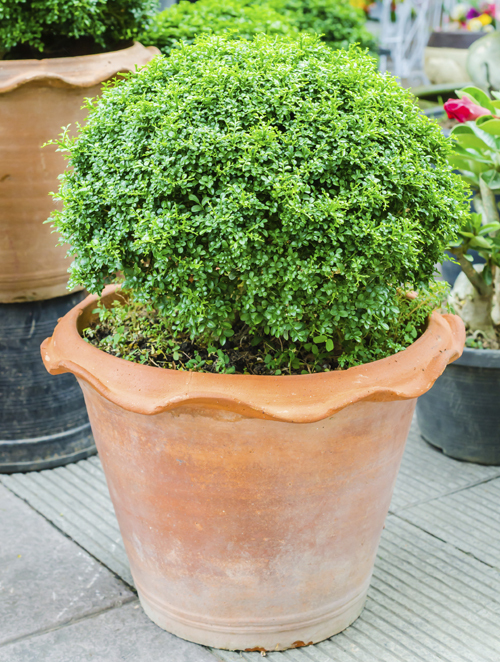 Trimming from trees and shrubs like evergreens, fir, holly, pine and redwood are ideal to use in garden pottery to create a decorative and lush display. Make sure when trimming that you cut downward growing branches to foster spreading. 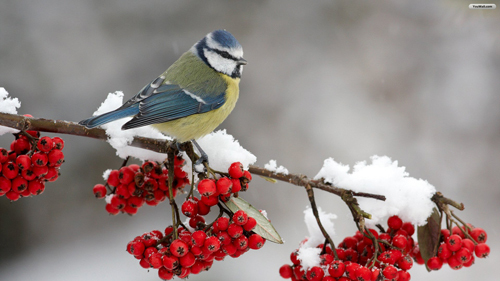 Look for holly berry branches so that you can add a touch of color. Recycle leaves by raking them up and adding them to your compost pile, or spread a thick layer around your plants. 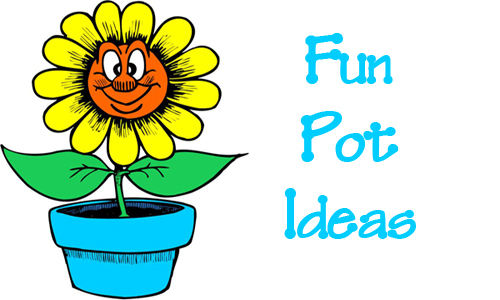 Top a potted plant if there are bulbs inside. You can always store them in plastic bags and toss them around each month just like you would a compost barrel. Next spring dump them into your garden soil to enrich it or mix with your potting soil when putting out your spring plants. 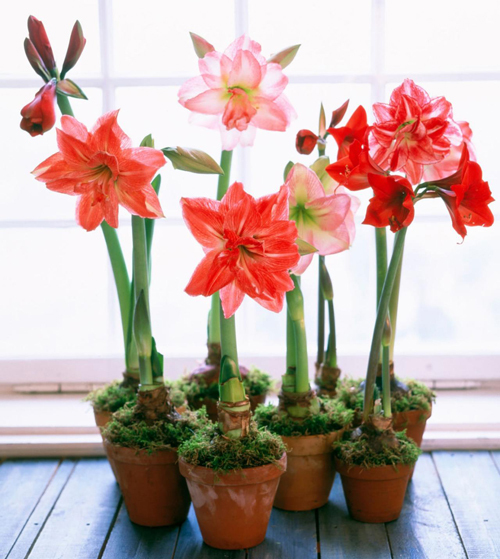 Grow Amaryllis now - These are some of the most elegant flowers of the holiday season. Buy them as bulbs that you can plant in your own garden container. The one shown is called a rose pot but we love the height with the tapered sides. Click here to view the planter. Bloom colors included red, white, pink and green. Miniatures are available. Enjoy a single amaryllis, or use several of the same type to create a living potted arrangement of color on a table or mantle. Tuck in a few ferns and mosses to fill out the display. Finally, don't forget to the feed the wildlife in your yard. A birdhouse is always fun and will encourage the birds to make a home and stick around for the other seasons. Place them in front of a window so that you can enjoy watching or by a patio where they will not be disturbed this time of year. 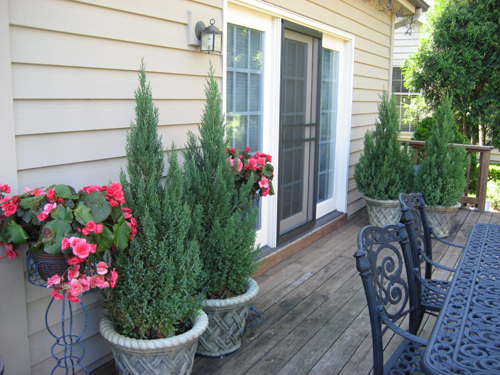 The planters below are filled with confires like Hinoki cypress which adds a wow factor to the pot. Don't let your pots just sit empty this time of year. There are so many different plant materials that you can fill them with that add depth, interest and color. The flowering blue star creeper and grass like Japanese sweet flag grass play supporting roles but are important to the interest and overall look of the planting. 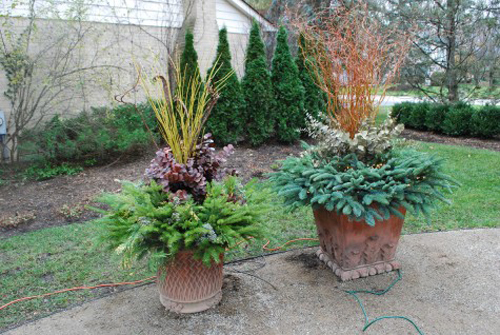 By using conifers in large garden pottery you can interplay the evergreens with other plant materials. Try to use a large enough pot to make the desired effect. Select a pot that has a bold and bright color to it. Nothing pastel will work here. You want bold fall colors with deep tones and glossy finishes. Then plant your main evergreen plant. Fill in with flowering plants like the cool seasonal annuals shown in the photo. Use at least 2 or 3 with contrasting colors to add depth. 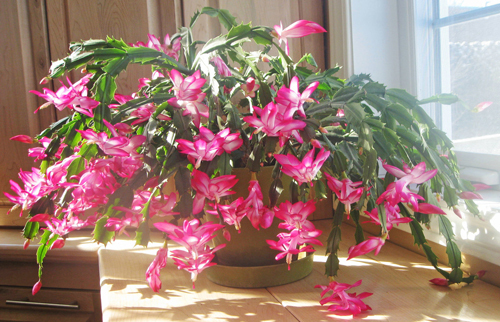 Flowering plants may fade over time but they are easy to replace and should last through fall and well into winter. 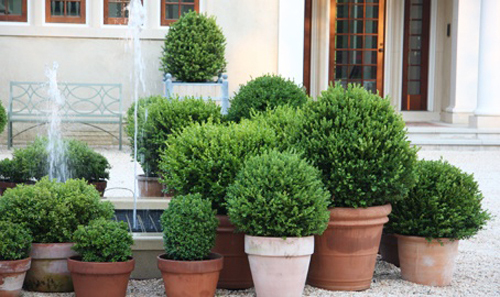 It isn't always easy to decide what plants in stunning garden planters you want to leave out. Obviously you will need to continue to water the plant materials. Not as much as growing seasons but unless they are sitting out unprotected and can absorb any rain that lands on the plants you will need to keep the soil from drying out. Therefore, the planters need to be high fired, glazed and waterproofed to with stand the freezing temps. We would still recommend that when it get's that cold you empty the planters out and store them if possible. Any standing water will freeze and could possible crack the pots. Do NOT use terracotta clay pots. They are low fired,, meant to absorb water, breathe and will crack if exposed to freezing temps. 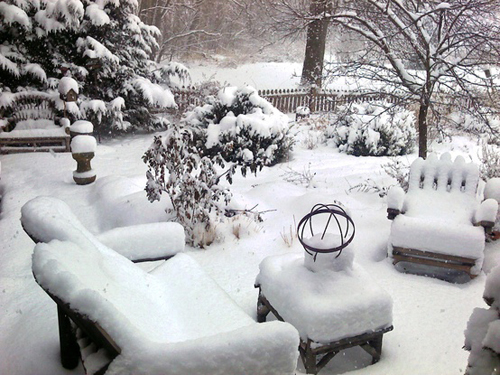 Don't leave your beautiful garden and patio areas bare this time of year. 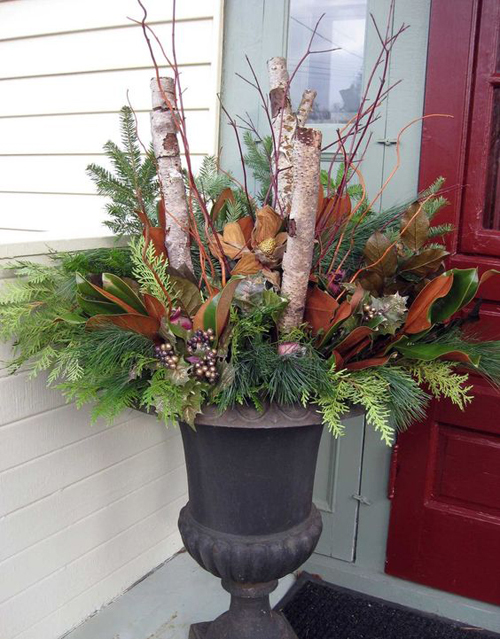 Purchase a bold colorful planter, fill it with evergreens and keep a colorful display all year long. Dreaming of Spring Color In Your Planters? 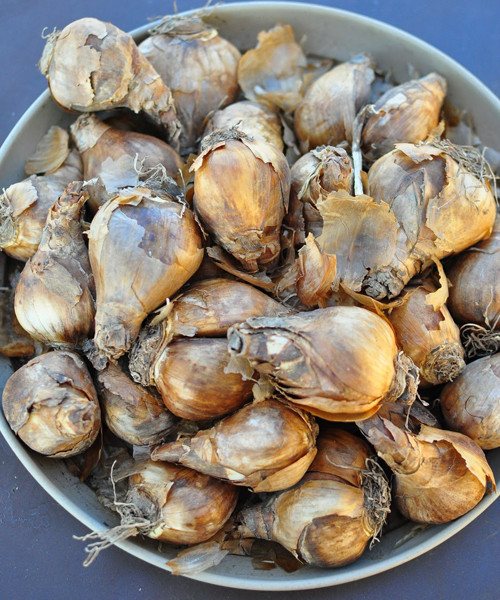 Here's the drill: Buy hardy bulbs now and plant them before the ground freezes. Get the job done fast and efficiently with these tips. 1. Clear a spot. There are many ways to do this but if you are searching for spaces to tuck in bulbs, focus first on fall garden cleanup. Open areas will be revealed when you pull out spent annuals and cut back perennials. If you are using a garden planter make sure that it is cleaned out. If you re-use the same soil, add fertilizer to it to pump it up and give your bulbs the healthiest start. 2. Choose a tool. Dibbles and trowels are good for digging individual holes for small bulbs. An auger, shown, reduces fatigue if you have lots of holes to dig. Use a shovel to excavate one hole for a large clump of a dozen or more bulbs. When planting in a piece of pottery, you can use a hand trowel or else you can fill the pot half full of soil, set the bulbs in the dirt and then cover over with more dirt. If your pot is sitting out exposed thru winter, we recommend covering the top soil with mulch or straw. 3. Dig the right depth. 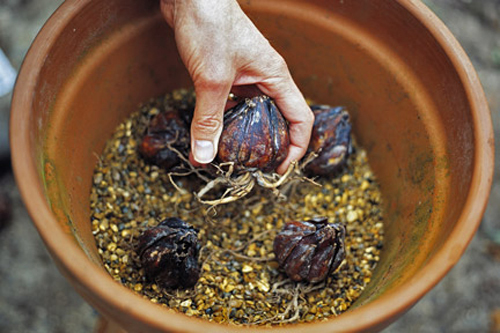 Plant bulbs at a depth three times their height. Make sure that you don't place them to deep. Make sure the growing tip is pointing up, like those pictured here. Cover with soil, water. Spread mulch over the top to prevent heaving from freezing and thawing. You may be asking yourself if it is too late to plant bulbs? You can plant spring flowering bulbs until garden soil is frozen or to hard to dig. But don't delay planting if you don't have to. The longer you wait, the less likely bulbs are to bloom next year. 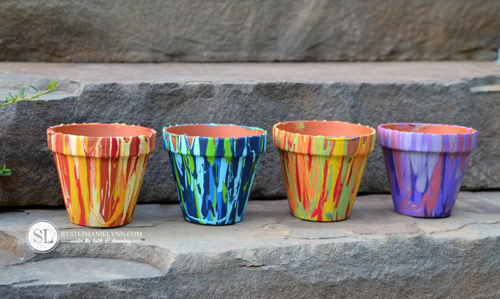 There are many fun things you can do with simple terracotta clay flower pots. We have a whole section on Pinterest of craft project divided into sections for holidays, birthdays, teacher gifts, Valentines Day, & much more. 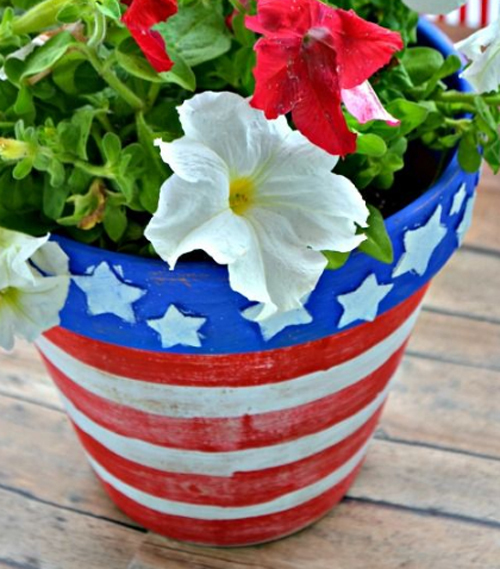 Check it out if you haven't looked at some of these easy and fun craft projects. In this blog entry we will just highlight a few fun tips. Enjoy! Ever thought of using a clay saucer to hold a SOS pad? It will keep it from rusting. Just leave it besides the kitchen sink and place the damp pad on it and the clay will absorb the moisture and keep the pad dry. Honest! 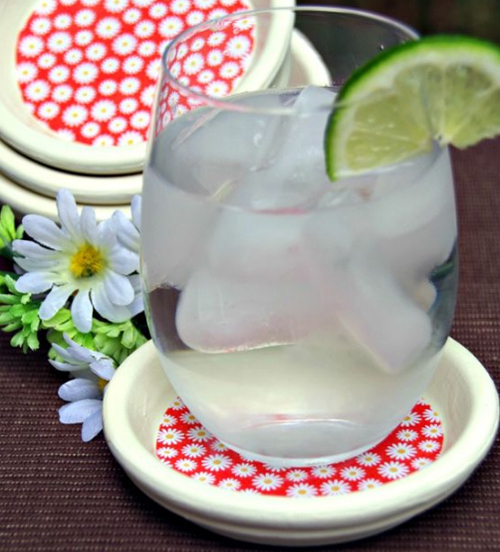 Use a clay saucer as a coaster. Line the bottom with felt to protect your tables and glue it on. Paint the any color you want but make sure you use a waterproof paint. Decorating for a holiday party. Valentines Day, 4th of July, Christmas? Paint clay pots in the colors that compliment the theme. Fill with napkins, silverware, candy or colorful flowers that match. They make great center pieces on the tables of any kind of function. Fill terracotta saucers with sand and set around a garden party to be used for ashtrays. Plant tomatoes in when you have no yard to grow in. Fill with cotton balls, toothbrushes, potpourri or treats and use indoors. Children love projects. Have them paint them with any decorations, stickers or items they can glue on and then plant in them. Fun! Read more.....The Art of Clay pot irrigation. 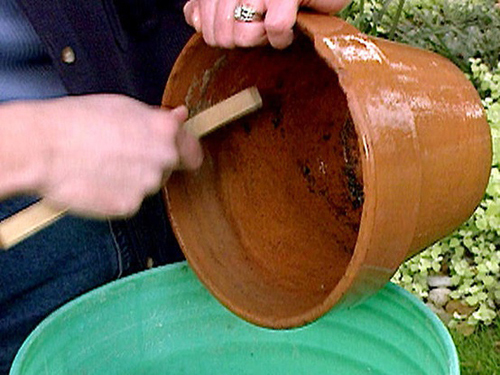 How To Clean Garden Pottery! 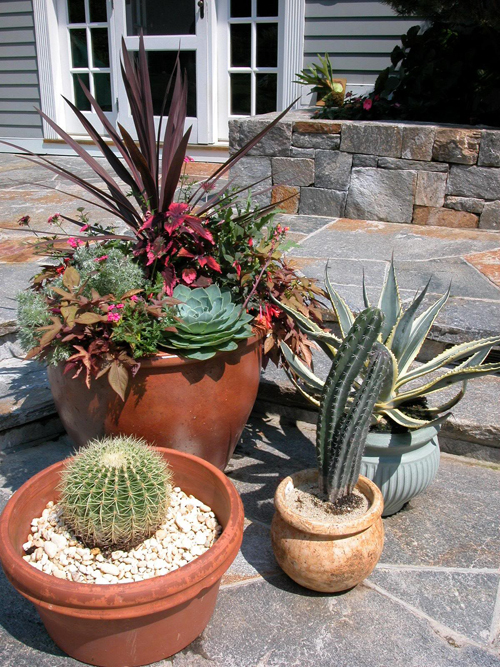 Terracotta pots offer a beautiful and natural home for all kinds of plants both indoors and out. The face that they breath offers many advantage for growing strong and healthy plants. Since the can absorb water, they also absorb the minerals and salts from the soil and any chemicals in the fertilizers used. If they are not cleaned at the end of each season those chemicals will rot the pot and eat away at the clay. Overtime the pots will fall apart. 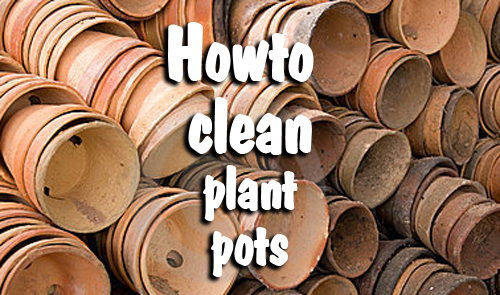 The pots can also develop a fungus that can rot the plant materials that are placed in them. These simple steps will prolong the life of your clay pots and help to keep your plantings lush and healthy. Remove all old plant materials and as much soil as possible. If there is any wet soil clinging to the sides, let it dry and then remove that also. 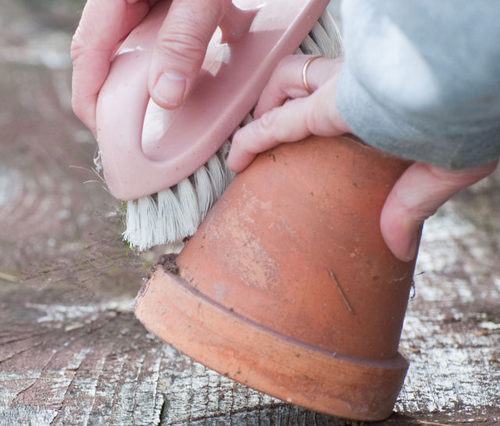 Use a scrubber brush of some kind to help brush away all the build up on the inside and outside of the clay pots. The photo shows a super brush that is shaped for pot cleaning and is available at most home and garden center. If still showing some residue you can fill a large pot or bucket with warm soapy water and soak the pots for a period of time, checking every hour or so. Rinse the pots with clear water and let dry completely. Sometimes salts can stick to the sides. We heard you can make a paste out of baking soda and water. Spread it over the buildup and use a soft brush to scrub it away. Then rinse in clear water and let dry. If you want to go one more step, we suggest sanitizing the pots. 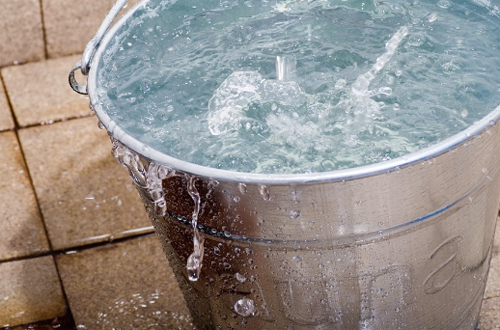 Fill a garden bucket with 10 parts water and 1 part bleach. Let the container soak for 30 mins. Drain it again and allow to dry. This final step will help with growing fungus. These are simple steps that make a huge difference. Once the garden pots are clean and dried completely, you can stack and store them for winter. If you leave them outside they could crack or break from the freezing temperatures. Read more.....5 Tips for success with tabletop containers. Read more.....A garden of reading. 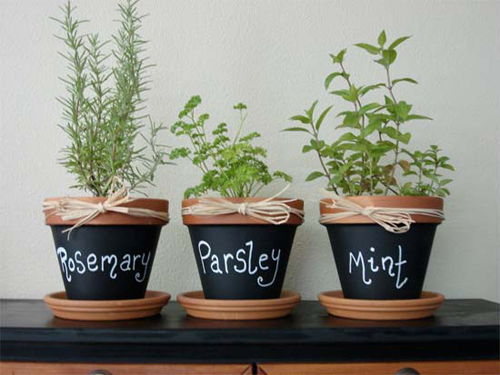 Start a windowsill herb garden! Create the only garden where you can do your cultivating in a lovely evening gown or your comfy pajamas if you like. Not only will you eat better and save money but by growing your own indoor potted herb garden you are keeping fresh ingredients close to your fingertips even during the winters cold months. There are a few things that need to be considered before you start but they are minor. Just dig in and have fun. You will be surprised how easy, fun, healthy and economical this hobby is. 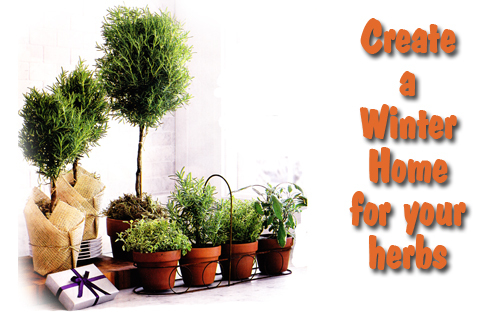 Start by placing the potted herbs near or by a sunny window. Place the die hard sun lovers in the center and the less demanding off to the sides. Oregano is a sun lover! 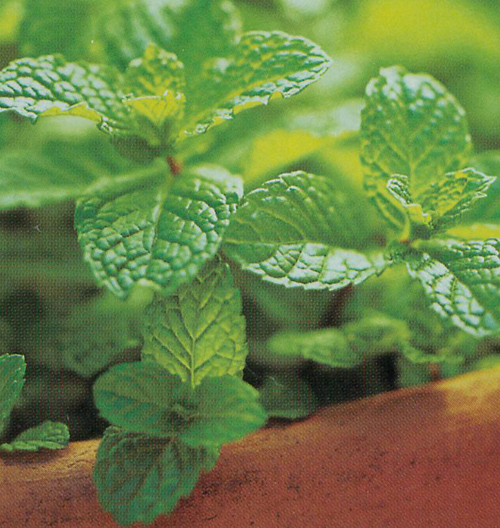 Even in late fall, it's not to late to pick up herb starters at any home and garden center. If for some reason you can't find them where you live, go online. There are many places to shop from now. The 5 that we recommend the most would be Oregano, chives, mint, rosemary, and thyme. They can be used on a regular basis because they are included in most home cook recipes. They are also hardy enough to make it through the winter in your potted garden. 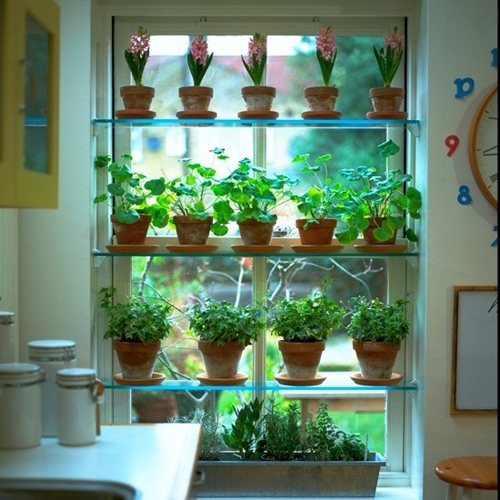 Since a potted windowsill garden takes up little space you will want to start with small pots. A 4" pot is a good place to start. Make sure they have drain holes and saucers to match. We like terracotta but any glazed or decorative container will work. Right now there are tons of cute set ups. We have seen clay pots in wire racks that are cute and portable for watering. Start with covering the drain hole with gravel, pot shards or pot filler. Fill with potting soil not garden soil, take the herb out of the nursery container and place on the soil and then back fill with more soil. Try to get a fairly tight fit without any air holes and fill to within 1/4" of the top of the planter. Water the soil and get growing! Once the winter months have ended you can transplant into a larger container on your patio or in your garden area. Keep all plants trimmed so they don't get over grown and woody. Most of all - have fun! Read more.....How to force paper white bulbs. Read more.....Succulents even in winter. When people first plant a garden or patio area with planters, they don't worry about how that area will look come winter. You rarely go outside let along walk through the back yard. 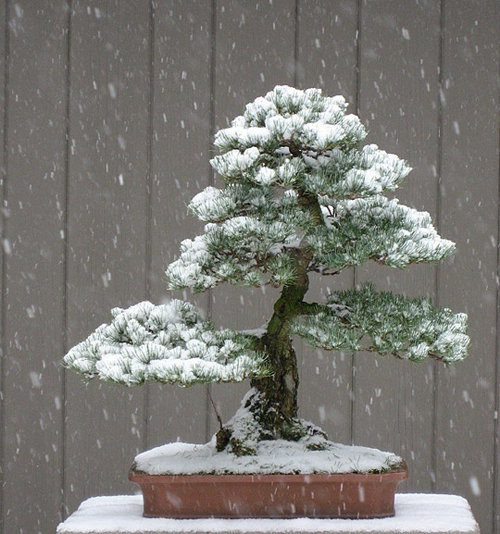 You will find yourself huddled indoors with garden catalogs or photos of new pottery you want to purchase next spring. Then boom! One day you see a neighbors patio area or you visit family and notice that someone has taken care of their planters and created a winter garden look. Now is your time! The easiest thing to do is start with one key area. Instead of taking on the whole yard, why not start on just your patio area. Start indoors and see if you view that area from any rooms like a family room or living room. If so what is it that you see. Just a portion of it or a few areas. Once you select an area think about what kinds of planters you will need to add some color. Go with high fired glazed pottery that can handle the cold months. Select some great grasses and plant materials to fill them with. Try Winter Jasmine, Witch hazels, colorful berry bushes and laurels. The whole idea is to create some colorful drama that will be set against a winter white background. You may want to take into consideration the bark of certain plants or trees. Once the leaves fall you will be looking at what is underneath. Are the branches straight as an arrow or curved in an interesting pattern? 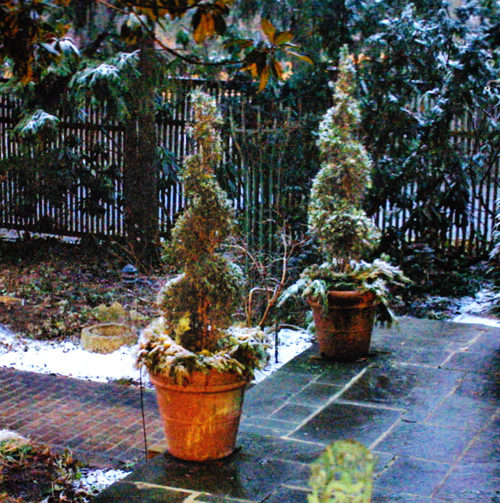 Try to picture your potted plants with snow on them. Will they droop over from the weight or be able to support it? 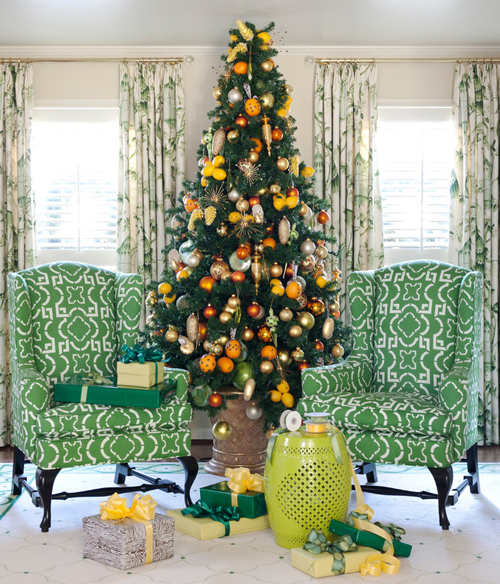 Decorate with some ornaments like birdhouses and statuary. The wildlife will appreciate you placing a birdhouse or feeder for them and then making sure that you keep it filled, and cleaned. Take a concrete statue and place it in an area where you can see it from the kitchen window. Place under a lush evergreen for cover and beauty or leave sitting on a vacant patio area where it will be loved and admired. Many garden ornaments can stay outside from one season to the next so don't strip the garden area once summer is over. 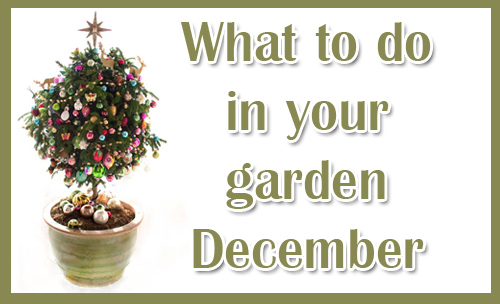 Any of these tips can be used as a starting point for a winter garden. Let your imagination run wild and look at what others are doing to gather some great ideas. Don't miss the opportunity to create something beautiful just because it's cold outside. 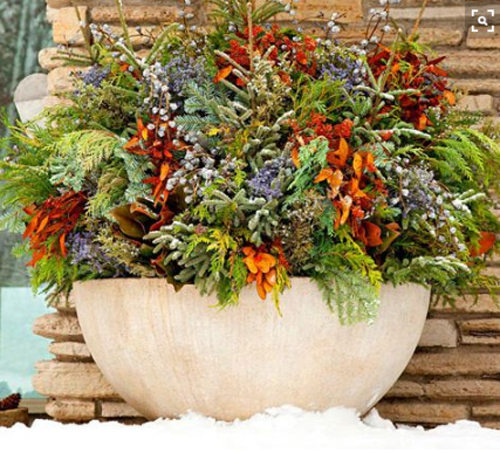 Read more.....Tips on creating a winter arrangement. 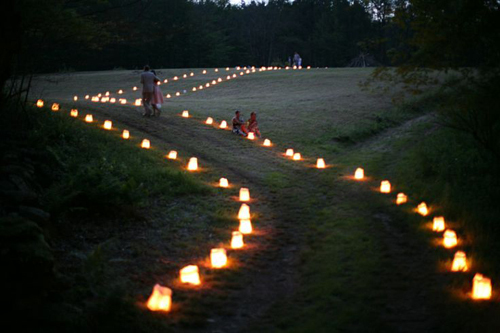 Read more....Focal points in your yard. Decorating! Yeah that's right - decorating. Sometimes the best materials for holiday crafts are close at hand: twigs and bean pods that might be strewn around the yard, and evergreen boughs off the trees. You can use them to make decorative rustic wreaths or swags to use on the porch, patio or indoors. Pick up a metal wreath frame from any craft store and place your boughs in a decorative pattern, securing them with craft wire. Pick up pine cones or bean pods and decorate the wreath with. 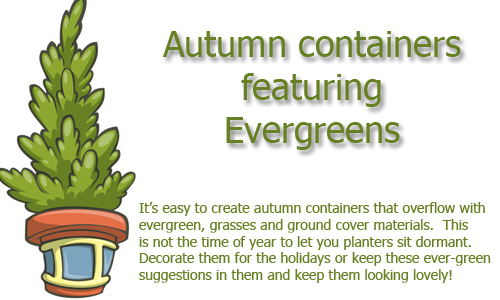 Fill empty garden pots with evergreens, pine cones and feathers. Don't leave your garden containers just sitting empty all winter long. Shopping - You think the nurseries in your area are closed for the winter? No way. They have wonderful plants like corsican violets or pansies still available to fill your garden planters with. Consider the corsican violet for a blue purple viola that survives extreme heat and cold climates. This perennials is perfect for planters, or rock gardens. 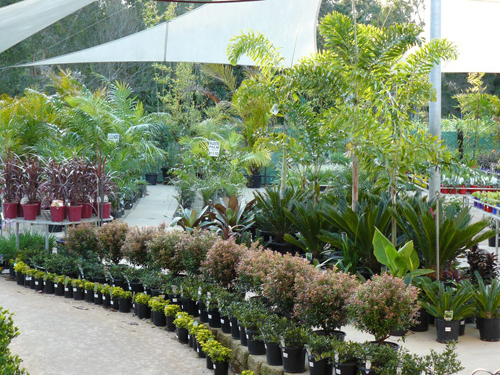 Look at your local nursery or order online. Pansies are cool season annuals that bloom from late fall through winter. Select a "living" Christmas tree. It looks great indoors during the holidays and then you can transplant it from the garden container to the garden soil when finished with it. Arizona Cypress is silvery blue and attractive. The Blue pyramid grows in the shape of symmetrical pylon 25 feet tall and 12 feet wide. Just plant in full sun and provide ample water for the first season till well established. 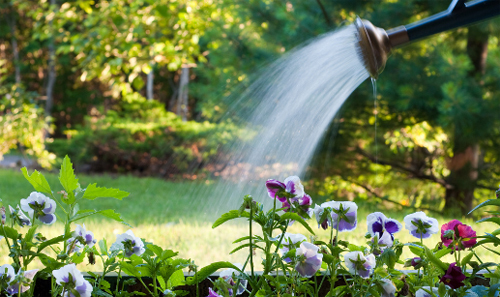 Now is the time to adjust your watering schedule. Even if you have drip systems in all your decorative pottery, you need to increase the number of days between watering time. 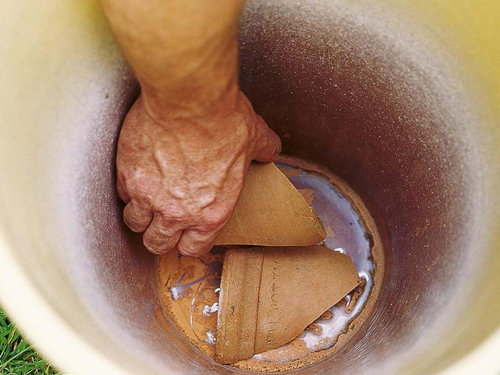 Make sure the standing water is absorbed and doesn't freeze or your pottery is going to crack. 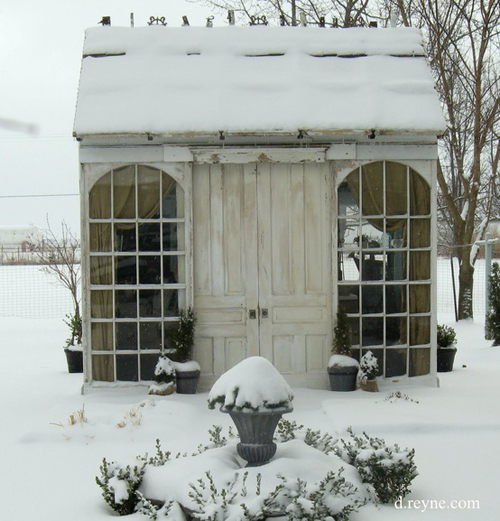 Lastly, you need to move cold sensitive potted plants under covered porches or below some kind of canopy. Don't water any cacti or succulents and protect the truck of any citrus trees with burlap or similar material. Read more.....Holiday & Gift Plants.